The Honor 8 comes in a neat box, where the phone is greeting you with its slim profile inserted into a slot, instead of lying face up. Inside there are just the usual suspects - a pair of Huawei headphones with design similar to Apple's EarPods, a USB Type-C cable and a wall plug capable of 9V/2A rapid charging. There are some nice cases matching the Honor 8's accent color available, but those are sold separately. Honor 8 spreads at 145.5 x 71 x 7.5 mm, which is about the same as the P9. The Honor 8 weighs 9g more at 153g, but it's not a difference you can easily feel when you hold it in your hand. Nor does it make too heavy a phone overall - it's about average in the 5.2" league. The Honor 8 is similar to P9 in a lot ways, but the design is where its unique spirit shines through. The Honor flagship is vastly different from its Huawei sibling and yet it is just as stunningly beautiful. The Honor 8's only place to use metal is the frame. A slightly curved chassis with the same paintjob as the two 2.5D pieces of glass it is separating. We got the blue model of Honor 8 and the combination of blue frame and blue glass plates is nothing short of flagship-grade. We are fond of the glass designs even though they are prone to fingerprints and smudges and require regular cleaning. Yes, the P9 has it all figured out with its metal unibody, but the Honor 8 is arguably the more eye-catching phone. The front of the Honor 8 is business as usual, but its back is where things get interesting. The dual camera setup isn't highlighted by a special plate, which allows for a seamless design. There are two small transparent circles for the two cam sensors and a place for the dual-LED flash. Even the rear-mounted fingerprint scanner is painted the same color and doesn't stick out too much. Speaking about the fingerprint scanner - it's of the always-on kind, and Huawei certainly knows its way around those - it's among the fastest and most responsive around. It also doubles as a configurable clickable button and you can assign up to three actions on single press, double press, and press&hold. This allows for instant access to favorite functions or apps. A closer look at the rear glass reveals an arc pattern within the blue color, almost like fingerprint lines. It is a very nice touch and we like that a lot. Handling the Honor 8 is a joyful experience due to the premium feel of the metal and glass body and the nice curves. Maintaining its looks is a different subject, though, as you need to clean fingerprints quite frequently. Above the 5.2" display of Honor 8 is the earpiece, the 8MP selfie snapper and a couple of sensors. There is also an embedded notification light underneath the earpiece grille but you can see it only when active. 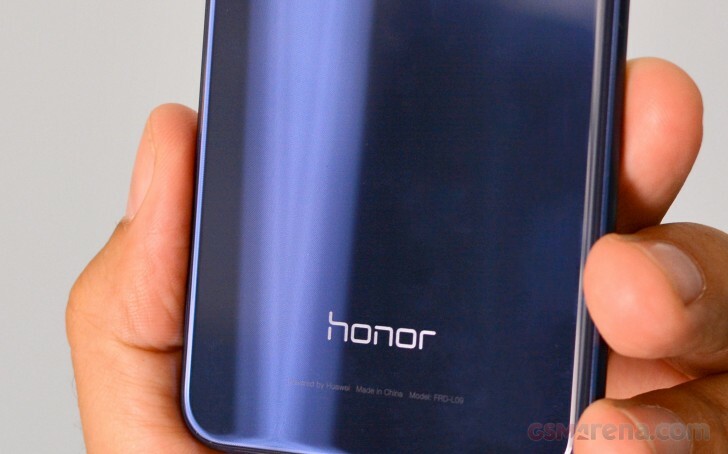 Below the screen is the lonely Honor logo. The left side of the Honor 8 has the SIM/microSD tray. It could either house a nano-SIM and a microSD card, or two nano-SIM cards if you got the dual-SIM Honor 8 flavor. This model uses a hybrid slot, so you can choose to either have a microSD or a second SIM. The metal volume rocker and power/lock key are on the right. The top of the phone has the IR blaster and the second mic. The bottom accommodates the USB Type-C port flanked by the audio jack and the loudspeaker grille. The primary mic is hidden somewhere beneath that grille, too. 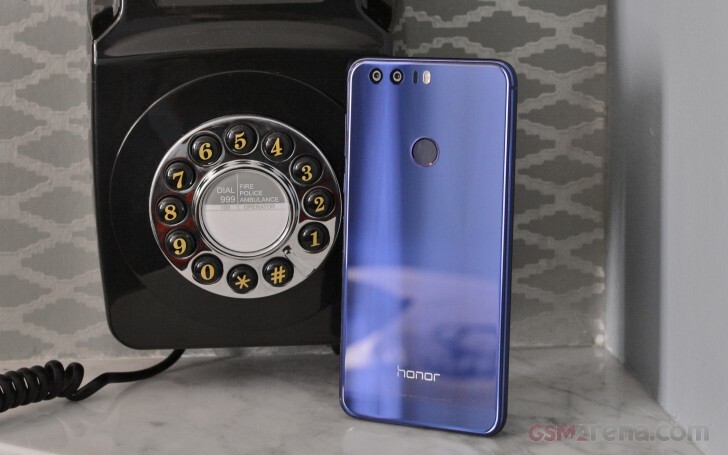 The Honor 8 features two 12MP sensors on the back, one is fairly standard and captures color photographs while the other is monochrome and is used to add more light, more depth, and reduce noise in the regular camera samples. The dual-tone flash and the laser for autofocus assist are also around.